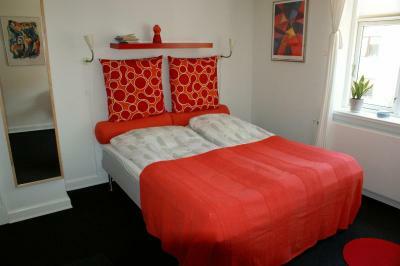 Lock in a great price for Billesgade B&B and Apartment – rated 9.1 by recent guests! I loved everything about this place. They even let me use their personnel phone to call my family because I didn't have a working sim card. Everything was just fine. I ordered an extra room for a friend, Carsten Bak Mathiesen. I did not quite understand or have time to use your offer for EURO 20 and the 10% for Carsten. I payed for Carsten, and he reimbursed me later. If you could still do good on your offer I will sure use Booking.com again. Wonderful room and service - comfortable bed and great breakfast. Staff was super friendly and helpful. 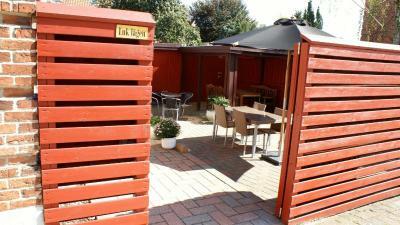 Great location close to the central rail station. Grocery market close by. 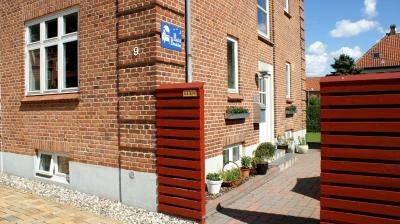 The B&B is located in a quiet neighbourhood about 10-15 minutes on foot from Odence C. The nearest bus stop is within 5 mins and some buses definitely go to Odense C (and 1 to the zoo if you need it). To get food you'll need to get back to the central station or even further downtown. But there's a fully equipped kitchen inside and 2 or 3 supermarkets in close proximity (3 mins) which work till 10 or 11 so you can cook to save or if you arrive late. There's a small garden to sit and relax. Breakfast is very nice - even if it's not buffet there's a great selection of food - and served in the room. The place is clean and bright and the host is a very nice and helpful person. The room was beautiful and very comfortable. The Wi-Fi in the room is very good. The staff is helpful. It is close to the train station. 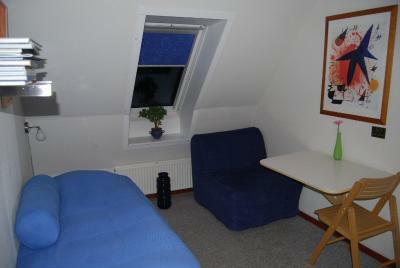 It was one of the best stay we have ever had: very cozy and very clean apartment. We felt ourself like at home. Thank you! Friendly owner running a B&B from a walking distance of the city centre. Free parking in front of the B&B, supermarket close by. Very clean and cosy space. Good bed and shower. A superb breakfast no complains at all. Brian is a caring, friendly host! Owner was wonderfully friendly and helpful, rooms and apartment were well furnished and very clean, the garden was wonderful for relaxing/eating, and overall a great value for the money! Lovely b&b rooms in Odense city centre, though on edge of centre in more quiet neighborhood. Great host and communication. 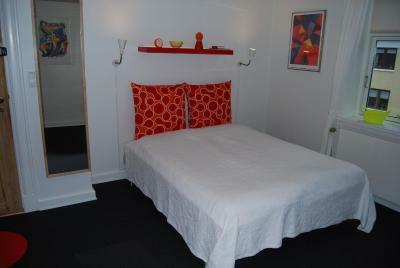 Nice clean and comfortable rooms. Free parking outside the door. Would recommend and use again. 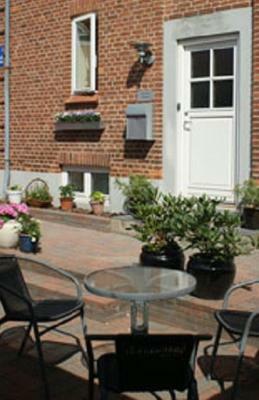 Billesgade Bed & Breakfast is located in a residential area, 15 minutes' walk from Odense Central Station and the city center. There is free parking on site and guest are able to rent bicycles. The bathroom facilities are shared. 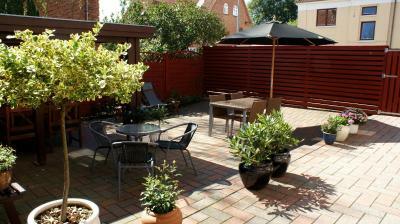 The property also has a self-catering apartment. 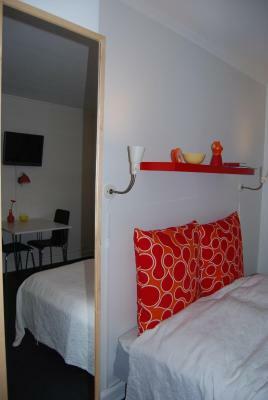 The rooms and the apartment are bright and colorful and feature free WiFi and a flat screen TV with cable channels. 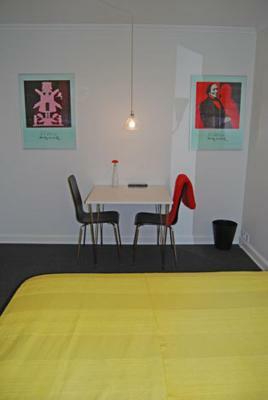 Free tea and coffee is available in the fully-equipped communal kitchen, which has a toaster, a microwave and hot plates for cooking. A laundry service is also offered on site. Guests have the option to buy breakfast with eggs from the property's own chickens. 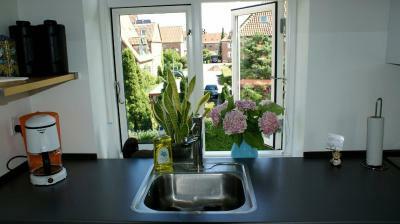 This property is also rated for the best value in Odense! Guests are getting more for their money when compared to other properties in this city. 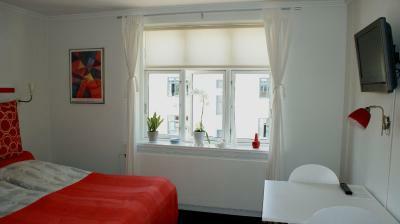 When would you like to stay at Billesgade B&B and Apartment? 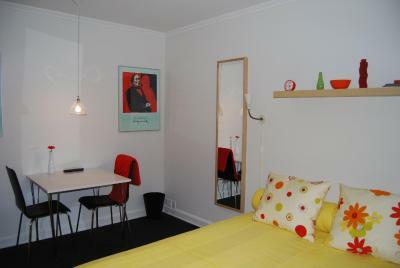 Bright and colorful room with a flat-screen TV, desk and seating area. Bathroom facilities are shared. 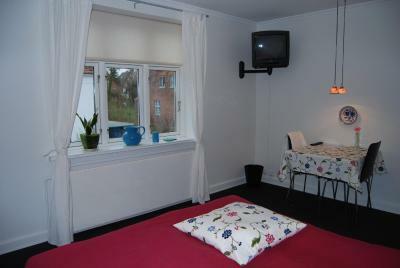 This triple room has a seating area, electric kettle and cable TV. 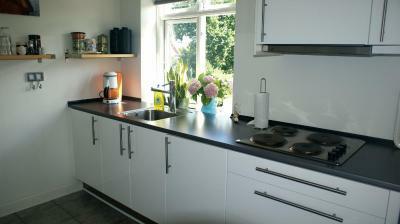 This self-catering apartment features a oven, seating area and dining area. Please note that breakfast is not available for this room category. House Rules Billesgade B&B and Apartment takes special requests – add in the next step! Please note that there is no reception. Guests are kindly requested to inform the property of their estimated arrival time in advance. This can be noted in the Comments Box during booking or by contacting the property using the contact details found on the booking confirmation. All requests for check-in outside regular check-in hours are subject to confirmation by the property. Please inform Billesgade B&B and Apartment of your expected arrival time in advance. You can use the Special Requests box when booking, or contact the property directly using the contact details in your confirmation. Staff is super friendly and helpful. Everything was clean and great. Breakfast was also delicious and customizable to your needs. Beds were not too soft nor too hard. Rooms had great curtains so you can turn it pitch-black when going to sleep. The room I lived was on the top floor. It was a little bit hard to carry the suitcase if you carry a heavy one. It is clean and easy to find. The room is warm. Good experience in this accommodation. Wooden floors and doors might be a bit noisy in the night. 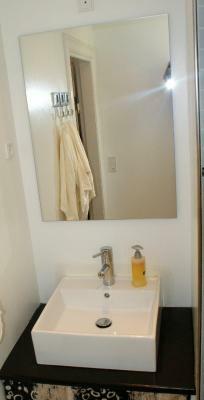 Nice, clean, free parking on the street, fully equipped guest kitchen and really nice shared bathroom. There is really nothing to complain about except for one thing. If you are sensible to noise during the night you better bring ear plugs. We experienced other guests arriving at midnight, taking showers, smashing doors which kept us awake for some time.. well, there is not much sound isolation since its an older house. First of all, a very warm welcome by the hosts which are incredibly friendly. 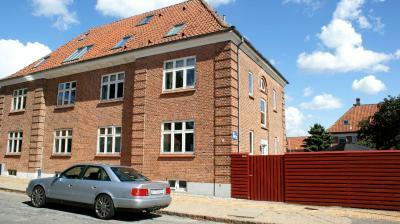 The house is located in a very calm district and street behind the station however just a 10-15mins walk to the city center. Free parking available in front of the house. The room we had was very spacious with view to the garden (room no 6), all the facilities (room, bathroom, kitchen) were super clean and the breakfast the next morning was simply amazing!! 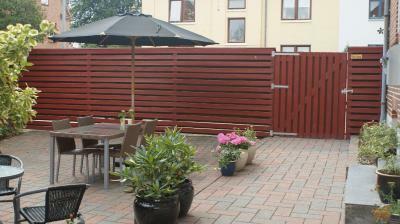 Thanks a lot for this great stay, we can definitely recommend Billesgade B&B! 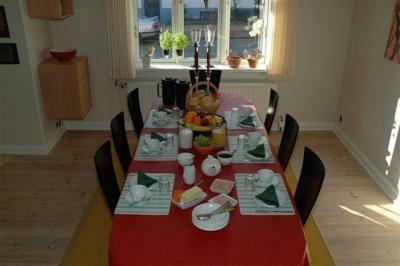 Very sweet and clean flat :) very rich and tasty breakfast! Clean and comfortable B&B, excellent breakfast (vegan was no problem), friendly staff. Exceptional value. Nice quiet location too. 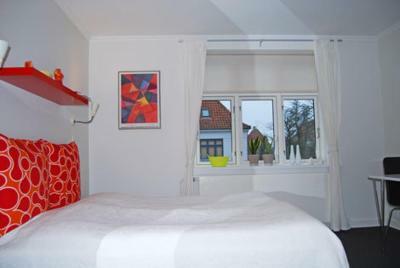 A lovely apartment close to the centre of Odense, an interesting and attractive town with several museums related to its most famous son, Hans Christian Andersen. There's also an excellent railway museum beside the station and a folk museum a few miles from the centre. 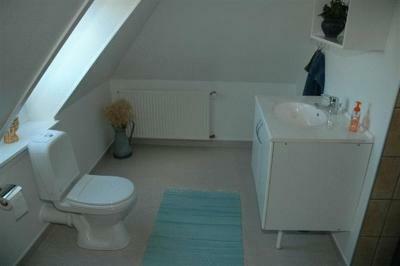 The apartment is light and airy and nicely furnished. The kitchen gives you the option to cook your own meals, but there is a good range of restaurants within 10-15 minutes walk. Perfect! No negatives to report. My room shared a bathroom with 2 other rooms, but that was not a problem.